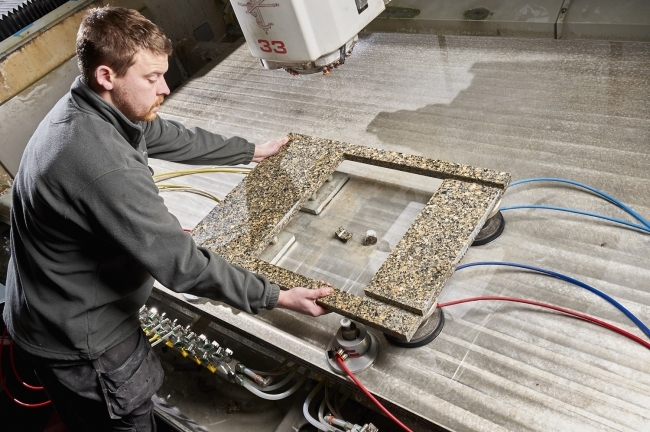 Natural Stone Surfaces, one of the UK’s leading quartz and granite worktop manufacturers, chose Atlas Copco to upgrade its essential compressed air supply and has improved its productivity and saved over £4,750 in annual energy costs as a result. The original air supply was provided by three fixed-speed compressors that were all running continually at full capacity. “We needed to reduce the cost of running these three compressors and were looking to replace them with a single machine. My first thoughts of choosing a new compressor were to turn to Atlas Copco, as it was a company I was aware of as a leader in the industry,” added Farrelly. The choice of supplier was also influenced by Atlas Copco’s environmental credentials, which echoed those of the company. Natural Stone Surfaces is committed to reducing its carbon footprint, maximising recycling and reducing waste. In addition, the company’s workshop and production machinery utilise recycled water that is cleaned on site. To determine the optimum compressor solution for the company, Atlas Copco conducted an iiTrak system energy audit to monitor Natural Stones Surfaces’ air demands during one week. The results of the assessment revealed improvements to the existing compressed air network were distinctly possible, and that the company could save over £4,750 in energy costs by opting for a Variable Speed Driven (VSD) compressor. As a result, a GA18VSD⁺FF full feature compressor with an integral refrigerant dryer, together with pipework, ducting and filtration, was installed. The variable speed rotary screw compressor supplies 7 bar high quality air at a rate of 14.7-61 l/s (31.2-131 cfm). This is sufficient to meet Natural Stone Surfaces’ compressed air supply demands, which is essential to power a variety of production equipment. 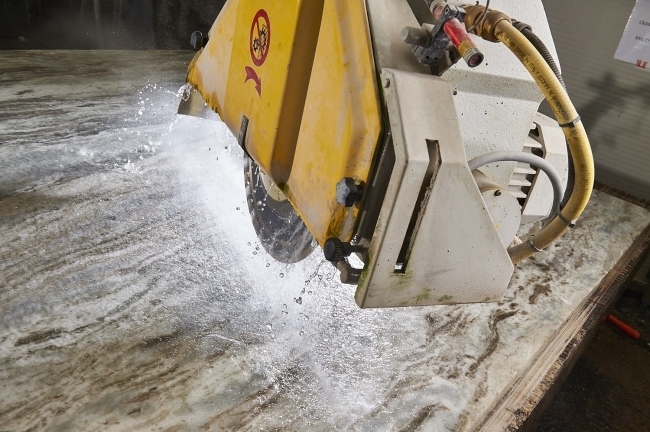 The company’s current factory inventory includes five vacuum lifts: two for manoeuvring slabs of granite, marble and quartz on to saw beds, another for loading and unloading an automatic inline polishing machine, and two for manoeuvring cut pieces of stone and quartz in the hand finishing department. Other applications for compressed air include: a battery of hand polishing tools, CNC cutting saws and inline automated straight edge polishers. Founded in 2001, Natural Stone Surfaces occupies a 25,000 sq ft. state of the art manufacturing facility in Chapel-en-le-Frith, Derbyshire. It is an enterprise that has made considerable investment in the latest computer controlled CNC technology. This approach allows for a wide range of profiling techniques and finishes to be applied to the company’s versatile output of quartz and granite worktops. Raw materials for its products are sourced from all over the world, then cut and finished by an experienced team of craftsmen. Every item supplied is finely polished, cleaned and sealed prior to despatch from the factory. 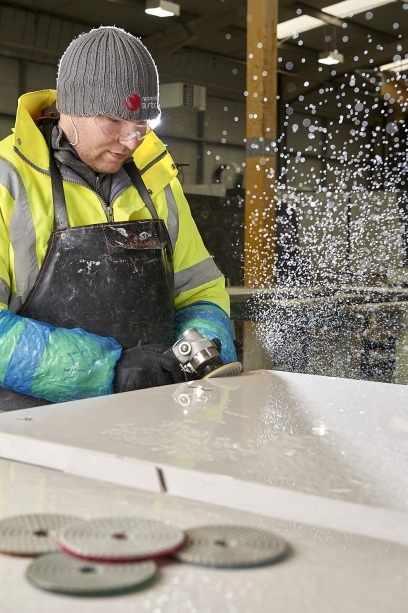 This ensures every worktop surface provides customers with maximum satisfaction and enduring quality. Natural Stone Surfaces’ customer base includes many kitchen studios across the UK and other European countries. The company’s commitment to quality and attention to detail has contributed to its continuing growth over the years. This has resulted from working with some of the industry’s most prestigious kitchen manufacturers and interior designers; all of whom demand an efficient service at a competitive price.